Village Books is one-stop shopping for all the readers on your list. With Christmas coming soooon, I thought I’d write down a quick list of my favorite stores for shopping in Bellingham. Whether I’m looking for a last minute gift or a little something for myself, I can count on these stores to satisfy my shopping urges. I’m a bit of a shopaholic, and I love to shop locally. The clothing and shoes category includes stores where I do more personal shopping than Christmas shopping, but sometimes you know someone’s taste/size well enough to buy a gift there as well. And socks are a great stocking stuffer (well, for grown-ups anyway). 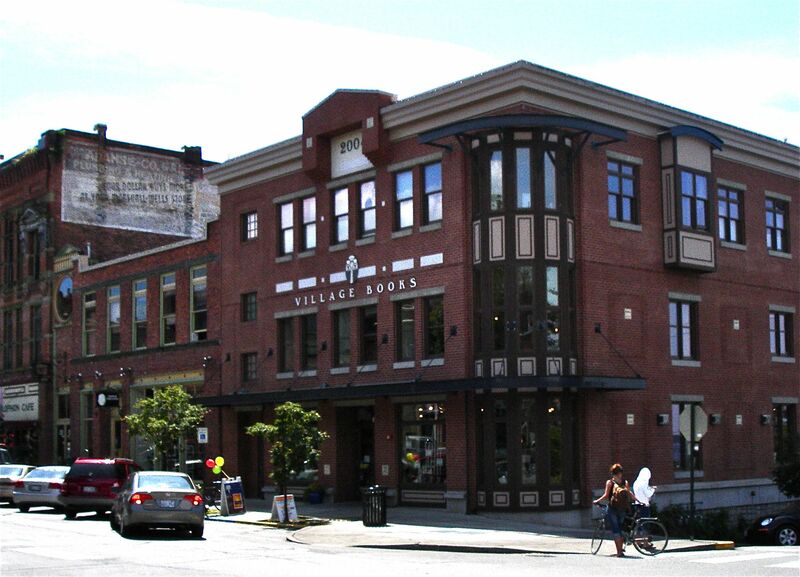 Village Books– A great bookstore in Fairhaven. Paper Dreams – Attached to Village Books, Paper Dreams has a bigger gift selection, as well as great Christmas cards and wrapping paper. Fairhaven Bike and Ski – Also in Fairhaven (as indicated by the name), this store is great for all your active friends. REI – If you can’t find what you’re looking for at Fairhaven Bike and Ski, check REI. They also have a lot of stocking stuffer-type gifts. MerchBot – For the humor lover, MerchBot has lots of super random things- think zombies and fake mustaches. Great for kids or kids at heart. Ideal – This store is great for the design junkie in your life. It has high style items at all price points and very nice women who own it. Fairhaven Toy Garden – So fun to look around, with toys for all ages. Greenhouse – This store has pretty much anything you might need for home decor, from garlands to furniture. It also has a great kitchen section. Digs – More awesome house stuff, it will make you want to redecorate! Covet – Handmade jewelry, art, and furniture make great one-of-a-kind gifts. Four Starrs – Located in Fairhaven, Four Starrs has a great selection of party dresses, cute jackets, and more. Sogourn – Great for a look around, you’ll find everything from classic black dresses to really trendy pieces in this store. Mi Shoes – Great quality, carefully selected women’s shoes. A bit pricey, but you’ll keep the shoes forever. Left Right Left – You know you’ve browsed their sale rack on the sidewalk. They’ve got some great stuff inside too! Including men’s shoes and some nice hats, scarves, and socks. 12th Street Shoes – In Fairhaven, this store has fashionable yet comfortable shoes for women. (Perfect for the Bellingham aesthetic.) They also have awesome tights.